Home BREAKING NEWS Hindu American Foundation Holds 2nd Annual Advocacy Forum In D.C.
Hindu American Foundation Holds 2nd Annual Advocacy Forum In D.C.
More than 50 lawmakers plus representatives from civil rights groups participated in the June 19 and 20 Policy Forum and Capitol Hill Advocacy Day hosted by the Hindu American Foundation in Washington, D.C. This was the 2nd Policy Forum and the 14th annual Advocacy Day organized by the HAF. 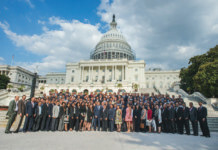 Organizers told News India Day the Capitol Hill advocacy was very successful. A day-long policy conference, an evening reception, as well as meetings on Capitol Hill were held, featuring discussions on protection of civil rights, how to combat hate crime, and the spread of terrorism and “violent extremism’ across South Asia. 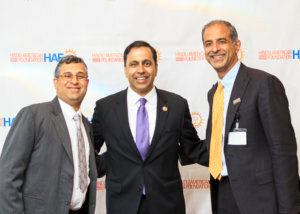 Rep. Michael Coffman (R-CO) with HAF Senior Director Samir Kalra. Photo: Tejus Shah. 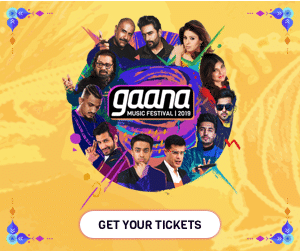 “We covered fifty-plus meetings with senior officials and lawmakers, and made two major asks,” Suhag Shukla, executive director and legal counsel at HAF said. Panelists at the policy forum included Tom Wheeler, acting assistant attorney general for Civil Rights at the Justice Department; Michael Lieberman, Anti-Defamation League; & Convener of the Hate Crimes Coalition Taskforce; Ron Mori, Japanese American Citizens League; Sushil Pandit, CEO of Hive Communication & Co-Founder of Roots in Kashmir; Seth Oldmixon, founder of Liberty South Asia; and Anita Wadhwani, India Country Director, Office of the Secretary of Defense, Asian & Pacific Security Affairs. During HAF’s annual DC advocacy day, on June 20th, delegates met with 50 members of Congress to discuss community concerns about rising hate crimes, the spread of terrorism, and the lack of transparency and accountability at the US Commission on International Religious Freedom. The delegation also addressed the need to generate greater awareness of heart health among South Asian Americans. The Advocacy Forum concluded with HAF’s Capitol Hill Reception attended by 200 guests including Rep. Raja Krishnamoorthi, D-Illinois; Michael Coffman, R- Colorado; Eric Swalwell, D-California; Pete Olson, R-Texas; Judy Chu, D-California; Sheila Jackson Lee, D-Texas; and Darren Soto, D-Florida. (D-FL). Charles Haynes, founder of the Religious Freedom Center and a vice-president at the Newseum Institute, was honored with the Mahatma Gandhi Award for the Advancement of Religious Pluralism. “It’s important for our community to be seen and for our elected representatives to see us,” Shukla said. “There’s a certain numbness that sets in when one sees just headlines. It’s different when an individual sits before you and says they are fearful and concerned,” Shukla added, referring to discussions the HAF delegation members had with lawmakers on hate crime and other issues. One of the asks of HAF related to adopting a resolution on rising hate crimes, which Shukla said had bipartisan support. There was considerable discussion on hate crime, the need for a more precise definition of the term, building awareness within the community and law enforcement about it, and how to report it. The second ask was the HAF’s critique of the U.S. Council for International Religious Freedom’s critical report on India released this February, prepared by Iqtidar Cheema, director of the U.K.-based Institute for Leadership and Community Development, in Birmingham, England. “Senior officers on the House and Senate side made inquiries and there was a sense of disbelief that an American government body like USCIRF had spent taxpayer money to retain someone with his (Cheema) background to write the report,” Shukla told News India Times. A State of the Union delivered by the president in person? Congress was not pleased.